Irvine, CA – Bluefin, the leading North American distributor of toys, collectibles, and hobby merchandise from Japan, Hong Kong and more, moves to the Dark Side for its latest Star Wars collectibles product with the release this month of the Samurai General “Daisho” Darth Vader. The high-detail, 7 inch poseable figure is newest addition of the Meisho Movie Realization Star Wars figure line by Tamashii Nations. The Meisho Movie Realization Star Wars line pays homage to the Samurai aesthetic and artfully reimagines iconic Empire characters from the legendary films with feudal-style Japanese armor and weaponry. 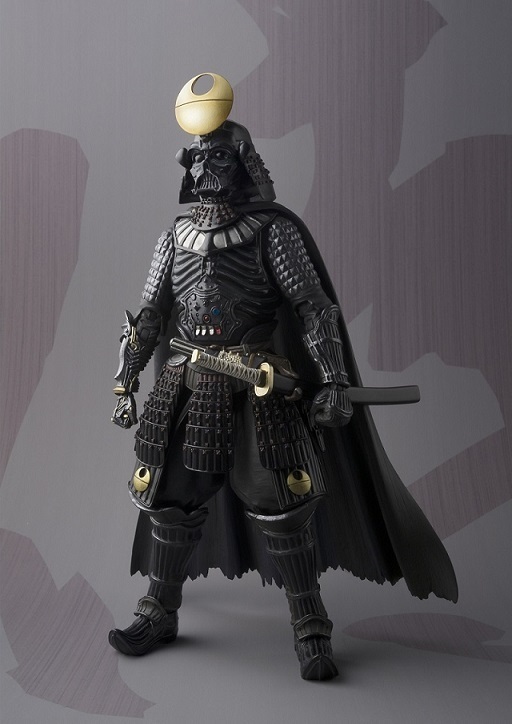 The greatly popular Samurai General Darth Vader makes a comeback in an all new Death Star motif. Another stunningly unique artistic interpretation master crafted by acclaimed artist Takeya Takayuki, Darth Vader - Death Star Armor - has a revamped armor design. Most notable is the fearsome Death Star-style crest on the helmet and highly detailed chest plate pattern. Set includes interchangeable hands, gun (large, small), and katana sword (light saber and regular). Fans can also enjoy other figures from the Meisho Movie Realization Star Wars product line – available now – that include the “Ronin” Boba Fett, “Ashigaru” Stormtrooper, and the Samurai General “Taisho” Darth Vader. Each is clad in a unique set of armor and comes with an array of weapons and other accessories. Additional new figures will be announced in coming months. For more information on Meisho Movie Realization Star Wars figures distributed by Bluefin, please visit: www.bluefincorp.com/catalog/tamashii-nations/meisho-movie-realization.html.